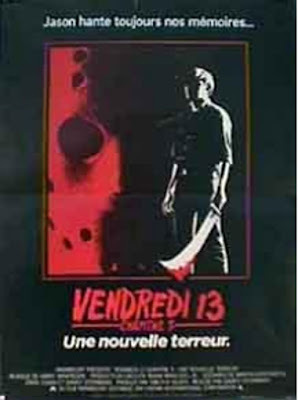 Castle Vardulon: Happy Avod the 13th! That's right, after months of plugging it's finally time to unveil the Jason-themed Avod! The Divemistress and I went a little overboard this time, deciding that each and every film deserved in-depth analysis. As a result, the Avod has been broken up into three sections, each of which can be downloaded by right-clicking on the following links and 'saving (the) target as'. PART 1 - In which we discuss Fridays 1-3, as well as debate timelines and characters' ultimate fates. PART 2 - In which we discuss Fridays 4-7, which include the series' highest and (near) lowest points. The poster was a little more difficult to track down. 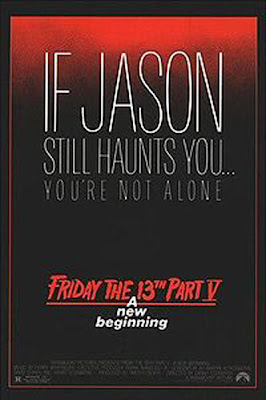 Searching for the "If Jason Still Haunts You... You're Not Alone" tagline led me to this, Part 5's British video box art. 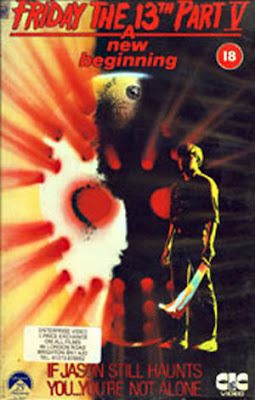 As you can see, it includes all the elements I was talking about , the tagline, the guy with the machete - still, I was sure it wasn't the image I remembered. In my memory the image was minimal, subtle, and classy, and that thing is none of those. That's certainly classier - it's understated and contains the tagline I love so well. But where's the guy? This is the exact poster I was talking about. Only not French. "Jason Always Haunts Your Dreams" doesn't have the same ring. 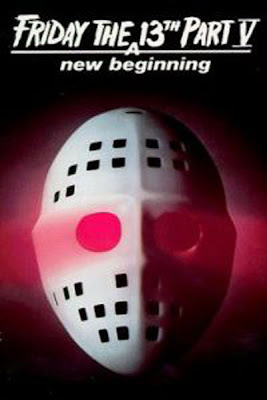 Although "A New Terror" is as good or better than 'A New Beginning'. 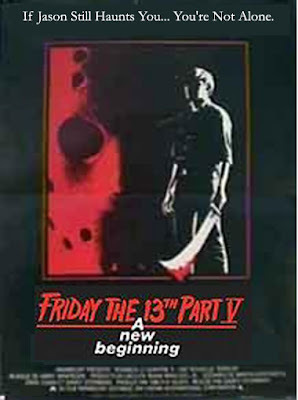 Try as I might, I couldn't come across a picture of the American version of this poster (although, FYI, an original copy of the American poster would make a great birthday gift next year). So, using my primitive, almost simian photoshop skills, I mocked this one up. Isn't that just wonderful? It's so ambiguous. The faceless, black and white guy - is it Jason, is it not? Who knows? The looming mask observing and overwhelming him, the great tagline... The poster even speaks clearly to the themes of the film! This is the poster the movie always should have had. Who could have possibly thought that was an improvement over the previous? Would it really have cost so much to keep that poster? That mask doesn't even vaguely resemble Jason's! Even the fake Jason in 5 doesn't wear one that looks anything like that? But you know who does wear a mask that looks exactly like that? That's right. 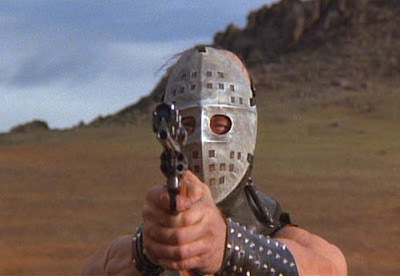 It's Lord Humungus from Road Warrior, upon whom Jason's appearance in Part 3-D was based. In fact, it's the exact model of mask from that film. Was this Paramount's way of finally acknowledging that Jason's look was lifted from the George Miller film?